Samajwadi Party leader and candidate from Rampur, Azam Khan has been slammed for his derogatory ‘Khaki underwear’ remark against former party colleague and BJP rival Jaya Prada. 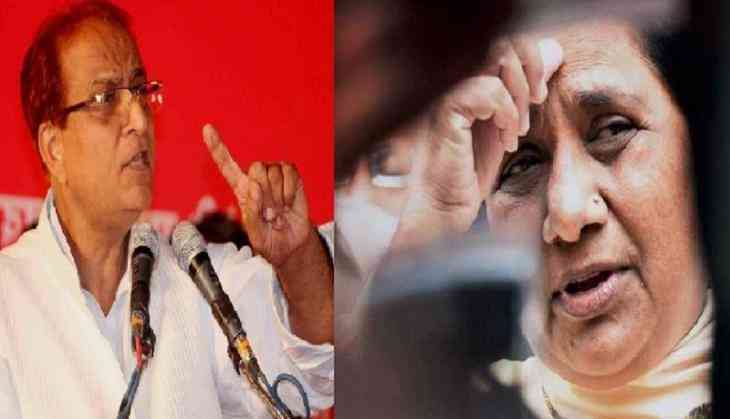 After attacking Jaya Prada, now Azam Khan has made another controversial statement and this time against Bahujan Samaj chief Mayawati. Azam Khan stirring another controversial comment said, “One should not be afraid of these collectors, I will make district magistrate clean Mayawati's shoes.” The 9 time MLA from Rampur, SP leader irked controversy with an ‘Khaki underwear’ jibe against actor and BJP candidate Jaya Prada on Sunday. Khan has alleged media of misquoting his statement and said he would not contest polls if proven guilty. Meanwhile, an FIR has been filed against the veteran SP leader Azam Khan for his comment 'main 17 din mein pehchan gaya ki inke niche ka underwear khaki rang ka hai'. National Commission for Women (NCW) has also sent a notice to SP leader Azam Khan over his remark, he made in Rampur (UP) on Sunday. Responding to the controversy, Azam Khan said he will withdraw his candidature from the ongoing polls if proved guilty. "I will not contest the polls if proven guilty...I haven't named or insulted anyone," Azam Khan told news agency ANI, on the crude remarks, allegedly made against Jaya Prada at an election rally on Sunday. "I was a nine-time MLA from Rampur and have been a minister. I know what to say," the SP leader said.